Associate Editor of "American Israelite." Rabbi and educator; born at Munich Nov. 6, 1815; died at Cincinnati, Ohio, April 5, 1882; educated at the University of Munich (Ph.D. 1837). In 1839 he accepted the office of principal in the newly established Jewish school of Riga, where he was appointed preacher also. The school was opened Jan. 15, 1840. In recognition of the sentiments expressed in the sermon with which Lilienthal opened the school the emperor Nicholas presented him with a diamond ring. In Dec., 1841, at the instance of Uvarov, minister of public instruction, to whom he was recommended by Count Maltitz, the Russian ambassador to Holland, Lilienthal was sent from St. Petersburg on an official mission. It was the intention of the government to establish Jewish schools for secular and religious instruction, and the duty assigned to Lilienthal was to determine the attitude of the Jews in regard to them and to quiet their fears as to the intentions of the government; for the plans of the latter were regarded with suspicion among the Jewish masses, who believed that the real purpose of the proposed schools was to lead the Jews gradually to conversion to Christianity. Lilienthal repaired to Wilna, where the community, acting on his assurances, appropriated 5,000 rubles for school purposes, and promised Lilienthal that more money would be supplied when necessary. But notwithstanding Lilienthal's assurances, the mistrust toward him of the Jews in Lithuania increased. At Minsk, whither he had gone at the invitation of the local ḳahal, he was given to understand that the Jews of Lithuania had no confidence in him. His stay in Minsk was rendered unpleasant by the resentment of the Jewish masses, and he even had to invoke the protection of the police. On his return to Wilna, Lilienthal found distrust of him growing there; thereupon, discouraged, he returned to St. Petersburg. After several months' arduous work in the offices of the Ministry of Education and with Count Uvarov, he returned to Wilna and prepared a circular letter to the Jews of Russia, published under the title "Maggid Yeshu'ah." When a council of rabbis and other prominent Jews was convoked at St. Petersburg, consisting of Rabbi Isaac ben Ḥayyim ofVolozhin, Rabbi Mendel Shneersohn of Lubavich, Bezaleel Stern of Odessa, and Israel Heilprin of Berdychev, Lilienthal was appointed secretary of a senatorial committee of fourteen. During the sessions Stern had many an encounter with Lilienthal and was even provoked to accuse him of ignorance of the Talmud. In the autumn of 1842 Lilienthal went to Odessa with letters of recommendation from Uvarov to Count M. S. Vorontzov. The Odessa community received him warmly, and appointed him their rabbi. Lilienthal was soon convinced, however, that his efforts in behalf of the Russian Jews would not yield the desired results; as a foreigner it was difficult for him to gain a true insight into their traditions, hopes, and aspirations. He did not understand them, nor they him; and he was placed in an awkward and delicate position by the distrust of the Jews on the one hand, and, on the other hand, by the efforts of the government to effect their assimilation without according them full rights of citizenship. 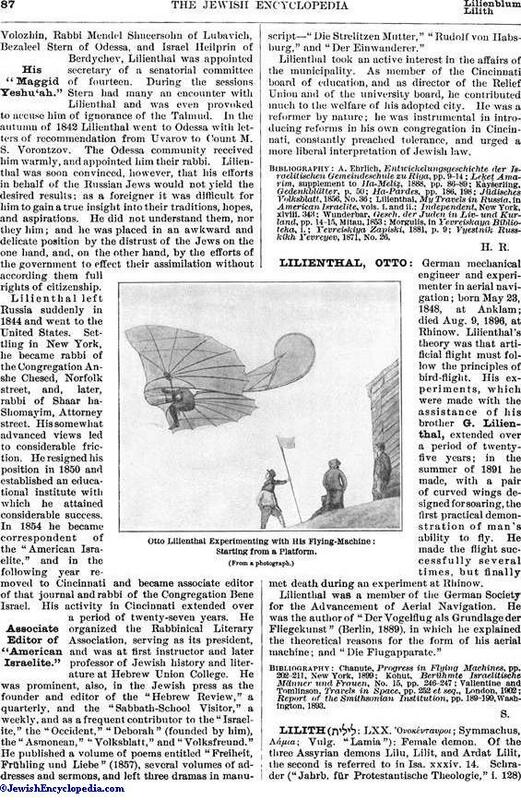 Lilienthal left Russia suddenly in 1844 and went to the United States. Settling in New York, he became rabbi of the Congregation Anshe Chesed, Norfolk street, and, later, rabbi of Shaar ha-Shomayim, Attorney street. His somewhat advanced views led to considerable friction. He resigned his position in 1850 and established an educational institute with which he attained considerable success. 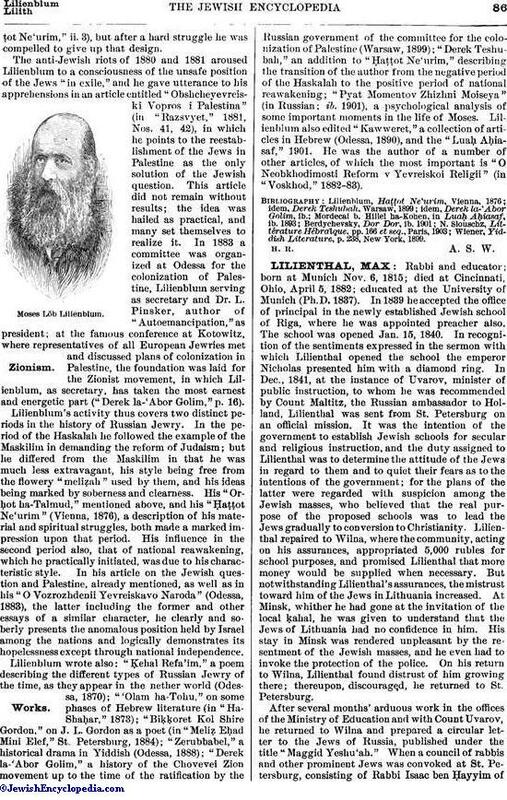 In 1854 he became correspondent of the "American Israelite," and in the following year removed to Cincinnati and became associate editor of that journal and rabbi of the Congregation Bene Israel. His activity in Cincinnati extended over a period of twenty-seven years. He organized the Rabbinical Literary Association, serving as its president, and was at first instructor and later professor of Jewish history and literature at Hebrew Union College. He was prominent, also, in the Jewish press as the founder and editor of the "Hebrew Review," a quarterly, and the "Sabbath-School Visitor," a weekly, and as a frequent contributor to the "Israelite," the "Occident," "Deborah" (founded by him), the "Asmonean," "Volksblatt," and "Volksfreund." He published a volume of poems entitled "Freiheit, Frühling und Liebe" (1857), several volumes of addresses and sermons, and left three dramas in manuscript—"Die Strelitzen Mutter," "Rudolf von Habsburg," and "Der Einwanderer." Lilienthal took an active interest in the affairs of the municipality. As member of the Cincinnati board of education, and as director of the Relief Union and of the university board, he contributed much to the welfare of his adopted city. He was a reformer by nature; he was instrumental in introducing reforms in his own congregation in Cincinnati, constantly preached tolerance, and urged a more liberal interpretation of Jewish law. Vyestnik Russkikh Yevreyev, 1871, No. 26.